About one kilometer from the town of Tevfikiye and 31 kilometers from Çanakkale, the famed city of Troy is usually high on every tourist's sightseeing list and makes a great (but long) day trip from Istanbul. Feted down through the ages, Troy is the legendary setting for the long Trojan War, a city only finally conquered when Greek soldiers hid themselves within the "peace offering" of the Trojan Horse to gain access to the city. Whether there's any truth to Homer's epic Iliad, which told of the battle, is beyond the point, for the archaeological site itself is an ancient attraction that has revealed a myriad of cities built on top of each other and has a history arcing back 5,000 years. If you have very little time up your sleeve, and the ruins of Troy are high on your agenda, you can visit Troy on a guided day tour from Istanbul. Be aware that it is a long day, leaving at around 7am and arriving back in the city usually about 10pm. You will see a wonderful slice of Turkish rural scenery as you travel through the green, fertile countryside of Thrace, with its sunflower fields, and cross The Dardanelles on your way to the site. The Troy Day Trip offers pickup from your hotel door in Istanbul, transfer by comfortable, air-conditioned minibus to and from Troy, a two-course seafood lunch in the charming seaside village of Eceabat, and a one-hour tour of Troy with an official guide who will explain the incredible depth of history on show here. If you're also interested in the WWI battlefields of Gallipoli, you can easily combine a visit to both Gallipoli and Troy on a Two-Day Small-Group Troy and Gallipoli Tour from Istanbul. This more leisurely option includes return transport by air-conditioned bus from Istanbul, a guided tour of the Gallipoli Peninsula's main battlefields, lunch, dinner, and overnight accommodation at a five-star hotel in Çannakale with breakfast. It also includes a guided tour of Troy on day two, with free time afterwards to explore other sights in Çannakale. Groups are limited to 14 people. The first Westerner to visit this site seems to have been a French government official named Pierre Belon in 1547. But it wasn't until German businessman and amateur archaeologist Heinrich Schliemann (1822-90) became convinced that the legendary city of Troy was located in the area known as Hisarlık that a great multitude of ruins came to light. A series of excavations led by him between 1870 and 1890 proved his assumption correct although his lack and disrespect of proper archaeological methods led to much evidence for his own theory being destroyed forever (particularly by the broad trench, which he drove across the site from north to south). Later excavations, under the leadership of German archaeologist Wilhelm Dörpfeld (1853-1940), were carried out much more scientifically. What Schliemann failed to realize at first was that he was not just excavating the ruins of one Troy, but of several different cities that had risen, flourished, and then floundered on this very spot. It was only Schliemann's last 1890 excavation and Dörpfeld's excavations in 1893-94 that suggested finally that the excavation layer known as Troy VI should be assigned to the Mycenaean period when this was the city of King Priam and the Trojan War was fought. The 10 levels that make up Troy I's excavation have shown that there was a fortified settlement of large, long houses on the rocky hill of Hisarlık some 5,000 years ago. About the middle of the third millennium, the Troy I settlement was extended towards the southwest. An area of 8,000 square meters was surrounded by a fortified wall, which was rebuilt three times. To the southwest stood a huge entrance of stone blocks, and in the center of the circuit of walls stood the palace of the ruler. In the upper section of Troy II (known as the "Burnt Town") Schliemann found what he called the Treasure of Priam (a cache of gold and silver vessels). This treasure has been dated to around 2400 BC. Schliemann was convinced until shortly before his death that this was Homer's Troy. 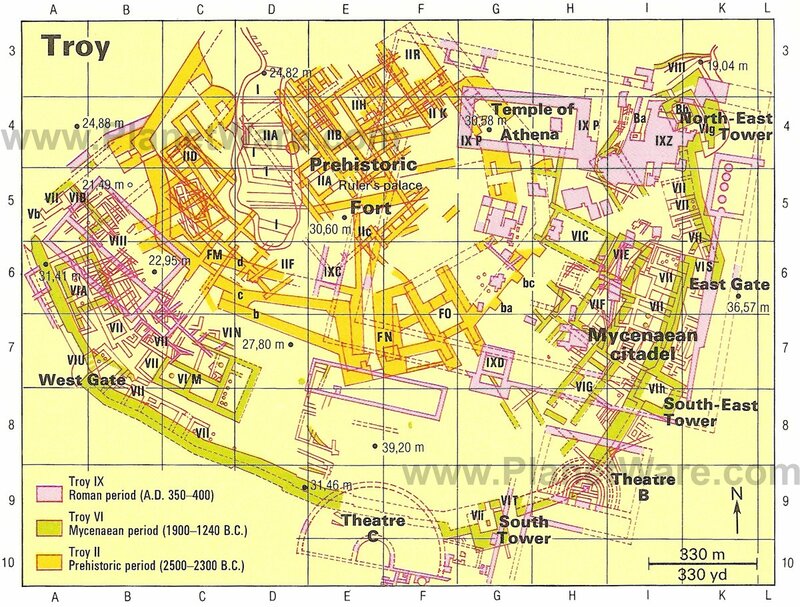 Troy II is made up of seven levels and was destroyed completely by a mammoth fire. The fire that destroyed Troy II left a two-meter thick layer of rubble and ashes. Later settlers dwelt in primitive huts, living from hunting, and little is known about them. Some vessels with depictions of human faces and thin goblets with opposing handles have come to light. The last layer of the 13 layers here indicates that this settlement was also destroyed by fire. It is the new town's huge walls of large, smooth-faced irregular blocks that form the most impressive of Troy's remains. In the years between the 15th and 13th century BC, the town enjoyed its greatest period of prosperity. The area of this settlement period is eight levels deep. The town was surrounded by a wall once 10 meters high. Inside the walls, the foundations of a number of palaces have been preserved. No trace has yet been found of a lower town in the plain below. The cemetery, which contains the funerary urns with the ashes of the dead, is located some 500 meters to the south. The town seems to have been rebuilt soon after an earthquake, but the inhabitants' way of life seems to have remained unchanged. A century later, the town was destroyed again. After the destruction of Troy VIIa the site was occupied by settlers from the Balkans. It is thought that the last people to settle here during this period were the Dardanians who gave their name to the Dardanelles. After an interruption, the site became a Greek colony around 730 BC. In 652 BC, after defeating King Gyges of Lydia, the Cimmerians moved into the area but without displacing the Greeks. In 547 BC, King Cyrus of Persia incorporated Troy into the Persian satrapy of Phrygia. In 334 BC, Alexander the Great crossed the Dardanelles and took Troy, where he offered a sacrifice to Athene Ilios. About 300 BC, Lysimachos built a harbor for the town at the mouth of the Scamander and replaced the old Temple of Athena by a splendid new one in marble. At least by the time of this construction work, the main buildings from the periods of Troy VII and Troy VI on the surface of the hill had been leveled. Between AD 278 and 270, the town was held by the Galatians, a Celtic people. Whereas the importance of Troy had previously depended on its Temple of Athena, which was ranked equal in status to the Temple of Artemis, it now enjoyed Roman favor as the city of Aeneas - Rome seeing itself as the political heir to Troy. There was now a period of great building activity. Until the incursion of the Goths about AD 262, Troy flourished, and this prosperity continued into Early Byzantine times. Constantine the Great even contemplated making Troy his capital. With the recognition of Christianity as the State religion, however, the old temples fell into ruin, and Troy's glory rapidly faded. In the Middle Ages, Troy still had a fortress, and until the 13th century it was the see of a bishop but after its conquest by the Ottomans in 1306, the town rapidly decayed. The ruins were used by the Turks as a source of building stone for their homes and tomb stele. Grass grew over the site and Troy fell into oblivion. This point, at the archaeological area entry, offers a view over the whole site. The East Wall, a part of the hill's defenses in Troy VI, consisted of an embanked substructure some six meters high and five meters thick and exposed on the outside. On top of this, one-meter above the ground-level of the settlement, was a vertical superstructure of flat rectangular stones, almost regularly dressed. The surface has been rebuilt with clay bricks. The South-East Tower was originally two-stories high. One of the characteristic features of the wall, the vertical offsets, can be seen in this area. They are spaced out at regular nine to 10-meter intervals. Beyond the wall and the tower, large houses of the Mycenaean settlement are visible: first House VI G, then to the northeast away from the wall House VI F, and further north Houses VI E and VI C. The houses of Troy VI were built round the hill on a number of concentric terraces with almost certainly the king's palace on the highest point. House VI F had pillars suggesting a second floor. Passing through the gate, it is clear that House VI E was particularly well built. It needs to be remembered that at the time these grandiose buildings were constructed, iron and steel had not been discovered. The quality of the stonemasonry is therefore all the more impressive. The wall projecting from the East Gate is overlaid with a Roman wall of dressed stone, which bore the columns at the east end of the temple. The defensive wall from the south helped to form a curving passage some 10 meters long and 1.8 meters wide. From one of more than 20 limestone altars that surrounded the Temple of Athena, it is possible to see the massive tower of the North-East Gate in the Mycenaean walls. The eight-meter-high substructure of fine dressed stone with a receding embankment once bore a clay brick superstructure giving the gate a commanding height. Within the gate is a square well hewn from the rock and descending to a considerable depth. It remained in use for a long period. In the Troy VIII period, a flight of steps was constructed on the north side of the tower leading down to another well outside the tower. The great retaining wall to the southeast dates from the Roman period. In the background is the auditorium of the Greek and Roman theater with the Dümrek Çayi plain beyond. Only the altars and mounds give any indication of the existence of the Temple of Athena. It has to be imagined lying to the west and north of the altars. The magnificent new temple promised by Alexander the Great was built by Lysimachos, but little survives. Columns, parts of the coffered ceiling, as well as other marble fragments from the temple built by Augustus "strayed" into the levels of Troy II during the course of the excavations. These fragments were gathered together by the researchers so that they could discover more information on the construction of the temple. From these heights there is a fine view over the Dardanelles, European Turkey, and the Menderes (Scamander) river plain. In the foreground lie remains of the "Burnt Town" (Troy II), which Schliemann believed was the city of Priam. This cross-section of Troy I's fortifications has a tower-like projection, and the South Gate lay behind. Troy I was built directly onto the rock floor, and layers four meters deep would suggest that this period endured for many years (ca. 3000 to 2500 BC). Troy I covered the smallest surface area, and in the course of time this settlement spread out to the south. Immediately above the tower stands a small propylon from Troy III. Its massive three-meter-long and 1.1-meter-wide stone threshold is still in place. The propylon was the entrance to a group of buildings in the center of Troy II citadel, which were probably occupied by the city's ruler. The dwellings of the ruler and his family led off a graveled courtyard. The main building directly opposite the propylon known as the Megaron consisted of a porch and a main hall with a hearth in the middle. The structure of the walls can be clearly seen here, but the height cannot be ascertained. It would have had a flat roof with an opening over the hearth. To the right was a smaller building with a porch, main room, and rear chamber. On either side were buildings of a similar type opening off the courtyard, but they were all destroyed by fire, leaving a two-meter-thick layer of stone and ash (Schliemann's "Burnt Town"). Many interesting finds have been unearthed in this level. The Troy II era (ca. 2500 BC) was characterized by major cultural and technological changes: a stratified society as witnessed by these buildings with the forerunner to the Greek temple ("megaron," porch and main room), the mixture of copper and tin to make bronze, as well as the invention of the potter's wheel. So impressed was Schliemann by the astonishing finds, he believed that he had found the "Treasure of Priam," but he was wrong by at least 1,000 years. The great north-south trench that Schliemann drove across the site passes between the first and second groups of Troy II houses, and it is possible to see house walls and parts of ancient settlements made from stones bound together with earth mortar. The restored supporting wall on the east side, made from air-dried clay bricks, marks the limit of the long, spacious buildings. A wooden bridge crossing the three ring walls of Troy II leads past the base of the ramp. From the corner of House M6A, a stone ramp to the Gate FM can be seen at a lower level. It leads from a lower settlement area (discovered in 1992) up to the inner citadel hill. This prehistoric citadel of Troy II had a circumference of some 300 meters and is now almost completely exposed. The layers of rubble range from a thickness of one meter to two meters. The citadel's ring of walls stretches out on both sides of the ramp. It consists of a substructure one-meter high made from roughly hewn limestone and earth mortar and was restored in1992. It now resembles the condition it was in before the first excavations about 100 years earlier. Some six meters northwest of the ramp, Schliemann found the so-called "Treasure of Priam" built into a cavity in the brick superstructure of the ring wall. It later found its way into the Museum of Prehistory in Berlin but disappeared at the end of the Second World War. It was later discovered in the Pushkin Museum in Moscow. Similar finds of jewelry, vessels, weapons, and tools made of gold, silver, electron (an alloy of gold and silver) and bronze have been made elsewhere in the Troy II level ("Burnt Town") and also in the layer of fire debris in Troy III. The remains of Troy III, IV, and V are of little interest the ordinary visitor. The citadel's principal monuments from Troy VI have been preserved, and of Troy VII some wall remains survive, chiefly those between the citadel wall of Troy VI and the first terrace walls. The two walls belong to quite different periods. First the walls and houses of Troy VI were repaired by simple country dwellers, who still used "Mycenaean" pottery. They built their own smaller houses (similar in plan to Troy VI) against the inside of the citadel walls. Facing the northern corner of House VI A, the remains of similar but larger houses (VI B) have been found. It is at this point that the "Mycenaean" wall, which at one time had encircled the whole citadel (about 540 meters in length) ceases, although about two- thirds of the full length still remains. At a much lower level, the huge foundations of the western corner of the citadel are visible, but its north side and a part of the west wall have disappeared. The preserved remains of Troy VII's wall are visible on the way to the fortifications for Troy VI. Inside the ring wall stands the impressive 27-meter-long supporting wall for House VI M, which certainly formed a part of Troy VI's citadel. This large building of the Mycenaean period on a four-meter-high terrace is known as the Kitchen Building on the basis of the large pithos (storage vessels) and other objects found in one of the rooms. A flight of steps inside led to a second floor. The shrine altars in the southwest show that soon after the Greek settlement and continuing well into the Roman phase, cult rituals took place outside the wall of "Sacred Ilios." The latest excavations reveal that the marble altar higher up dates from the time of Augustus, when the whole site of Ilios was renovated. A tribune and more shrines are situated beyond. The large supporting wall and the older altars lower down all originated in Hellenistic times (Troy VII). At the edge of the former agora stood the Odeon, a small theater for musical performances, and a little further east the bouleuterion, the Roman town hall. The Odeon consists of a semi-circular orchestra separated from the skene or the stage building. The rows of seating are divided into wedge-shaped blocks. Some of the fragments belonging to the Odeon are gathered together nearby. The bouleuterion, about 70 meters away, was built above Troy VI's fortified wall. The interior was surrounded by a wall on all sides, enabling the city fathers to conduct their business uninterrupted. The South Gate was probably the main entrance to the town, but only the paved roadway to the right of the tower (1.3 meters wide) remains. A covered water channel is in the middle. To the left behind the South Tower, a pillar marks the location of the "Pillar House," which with a surface area of 27 by 12.5 meters was one of the largest houses of Troy VI. Set in front of the tower are two vertical stones, no doubt serving some cult purpose.